While we await the latest details on the ongoing trade war between the US and China, currently focusing on escalating steel and aluminum tariffs and China's reciprocal response could be, the threat of a real war is looming. 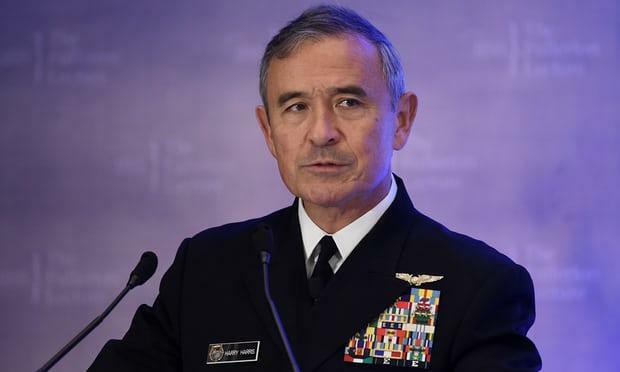 Admiral Harry Harris says China’s military might could soon rival US power ‘across almost every domain’, and warned of possibility of war. In an excoriating assessment of China’s increasingly muscular posture in the region - which some say is merely a response to similar, long-running posturing by the US in the region - Admiral Harry Harris said Beijing’s “intent is crystal clear” to dominate the South China Sea and that its military might could soon rival American power “across almost every domain" according to the Guardian. Harris, who is set to retire as the head of US Pacific Command in Hawaii, told the House armed services committee that the US and its allies should be wary of Beijing’s military expansionism in the region, and condemned China’s foreign influence operations, predatory economic behaviour and coercion of regional neighbours. "China’s intent is crystal clear. We ignore it at our peril. I’m concerned China will now work to undermine the international rules-based order." At least he didn't accuse China of also hacking the US election: so far it's only Russia that gets to pick and choose the next US president. Harris said he was alarmed by China’s construction of military bases on seven disputed islands in the South China Sea that neighbouring countries lay territorial claims to. In 2016, the permanent court of arbitration in The Hague, sided with the Philippines in the dispute it brought, saying there was no legal basis for China’s claim of historic sovereignty over waters within the so-called nine-dash line in the sea. Regardless, Chinese military build-up continues in the sea with Beijing refusing to comply with the Hague's ruling. “China’s impressive military build-up could soon challenge the United States across almost every domain,” Harris said. Harris also warned of a “cult of personality” developing around Chinese president Xi Jinping. In other words, the US should get prepared for war with China. Harris praised Australia as one of America’s staunchest allies in the Asia-Pacific region, noting existing military cooperation at air force bases in the Northern Territory, joint naval exercises and the regular rotation of 1,500 marines through Darwin. Should Harris be confirmed as the next ambassador to Australia, his hawkish position would present a challenge for Canberra, as it seeks to navigate an increasingly delicate diplomatic and economic relationship with Beijing. Domestically, ties with China have been severely strained after a backlash against China’s perceived influence on and infiltration of Australia’s political system, highlighted by the resignation of Labor senator Sam Dastyari over accepting cash from Chinese businessmen for private debts and his position, at odds with his party, on the South China Sea. The Australian government has proposed new espionage laws and tightening of rules around foreign donations to political parties. At the same time, China is Australia’s largest trading partner, but the US is its primary defense and security ally, and Australia has been a vocal defender of the US alliance network over issues such as the nuclear weapons ban treaty, which the US opposes. The Australian prime minister, Malcolm Turnbull, who has previously met Harris in Hawaii, has publicly welcomed his nomination. “Great to see Admiral Harry Harris nominated by [Donald Trump] as US ambassador to Australia. Look forward to seeing you in Canberra, Harry,” Turnbull said on Twitter on February 10. Turnbull will meet with Trump in Washington next week. It is not known when Harris’s confirmation hearing will take place. Harris, the Yokosuka-born son of an American naval officer and a Japanese mother, has been nominated by President Donald Trump as the next ambassador to Australia. His appointment must be confirmed by the Senate. Australia has been without a US ambassador since John Berry departed in September 2016.